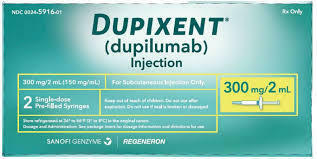 Dupilumab is an interleukin (IL)-4 receptor alpha antagonist that was approved by the US Food and Drug Administration in March 2017 for the treatment of adult patients with moderate to severe atopic dermatitis not adequately controlled with topical therapies. In addition to effectively treating a resistant case of atopic dermatitis, the eczema drug dupilumab (Dupixent, Regeneron Pharmaceutics) triggered hair growth in a young patient with longstanding alopecia totalis, investigators report. The dual efficacy of the interleukin (IL)-4 receptor alpha antagonist, which was approved by the US Food and Drug Administration in March 2017 for the treatment of moderate to severe atopic dermatitis, may be explained by the immune characteristics shared by both conditions, Lauren R. Penzi, MD, from the Department of Dermatology, Massachusetts General Hospital, Boston, and colleagues write in a case report published online October 10 in JAMA Dermatology. Atopic dermatitis is a TH2-mediated disease with elevated IL-4, IL-5, IL-13, and IL-31, and although the pathogenesis of alopecia totalis — an advanced form of alopecia areata — is not fully understood, recent studies point to a strong TH2 link as well, the authors write. Dupilumab improves eczema symptoms by blocking the signaling of IL-4 and IL-13 cytokines, which play a role in maintaining the immune response of TH2 cells. The case report describes the treatment of a 13-year-old girl with a history of treatment-resistant atopic dermatitis since age 7 months and atopic totalis since age 2 years. Previous treatment for alopecia totalis with topical squaric acid and anthralin was not effective. Trial treatment for both conditions with pulsed prednisone and methotrexate led to some improvement in the dermatitis, but not the alopecia, and thus was discontinued, and topical steroid treatment for the dermatitis did not produce an adequate response. The patient began weekly injections of dupilumab in 2017. After 6 weeks of treatment her eczema improved significantly and vellus hairs began growing on her scalp. “Nine months after beginning dupilumab treatment, the patient had grown pigmented, terminal hairs on approximately 60% of the scalp,” the authors write. During an unplanned 2-month treatment hiatus related to insurance coverage, the patient reported hair shedding, which resolved when treatment was restarted. “At last follow-up, 11 months after the first dupilumab dose, considerable hair growth was noted,” the authors write. The patient reported minimal dry eye, a side effect that has been reported previously with dupilumab treatment, as have other adverse reactions including injection-site reactions, conjunctivitis, blepharitis, oral herpes, keratitis, eye pruritus, and other herpes simplex virus infection, the authors explain. “There have been no reports to our knowledge of hair growth in alopecia areata related to dupilumab,” they note. “Right now, it’s hard to know whether dupilumab could induce hair growth in other alopecia patients, but I suspect it may be helpful in patients with extensive active eczema and active alopecia areata,” senior author Maryanne Makredes Senna, MD, from the Department of Dermatology, Massachusetts General Hospital, Boston, said in a hospital news release. It is too early to tell whether dupilumab could trigger hair regrowth in other patients with alopecia totalis or individuals with other types of hair loss. “We first need to clarify what kind of hair loss we are really discussing, since there are many forms. The form discussed by the authors, alopecia areata, [is] an autoimmune form of hair loss that is seen more commonly in those younger than age 40, but can occur in anyone of any age,” McMichael explained. “As noted, this form of hair loss is mediated by white blood cells that have certain markers identifying them as TH2 cells, and atopic dermatitis is known to be mediated by these same kinds of cells, though the mechanism of each is very complex and differ in many ways.” As both disorders are often seen in the same patients, “the idea that a single treatment might work for both is not completely out of the realm of possibility and has been observed with other biologic medications in the past,” she added. The investigators report that they have submitted a proposal for a clinical trial of dupilumab in patients with extensive active eczema and active alopecia areata.